NORAD COMMANDER REVEALS ALL: MILITARY WILL NOT POLICE U.S.! General Jacoby, merely solidified what I had already known…. but it was good to hear a “working General” describe what the role of the DoD is and their role, in detail. Nothing in his responses indicates any deception, and clearly, he appears to be stating the truth to the best of his abilities. Some may disagree, but, this is an area that I personally excel at, and there are NO SIGNS of deception in his responses. I believe he is stating everything at face value. It’s time to do your part ! Pick up the phone, NOW. WE THE PEOPLE OF THE UNITED STATES, HAVE THE POWER TO STOP THIS. If you run Facebook groups, have a twitter account or a website. PLEASE make your own post and help start a phone storm on Congress. Everyone has my permission to copy this and put it out there. 9am EST Monday, July 28th 2014. The Third World War is planned to begin when Israel goes to war against her Arab enemies. Then, and only then, will all the other elements begin to occur and they will do so in rapid succession. The plan is to have one disaster following another in such rapid succession that, before people can mentally and emotionally handle one disastrous news event, they will be hit with another. It is also accurate to say that until ALL of the elements for WW3 are in place, the plan will not commence. Click on map to find your congressional phone numbers. Tell them to STOP funding Israel and stop this genocide in Gaza. This is a list of companies that are Israeli owned or back Israel financially. This is their list lets use it against them and start a boycott…. Buy nothing that supports Israel. THESE COMPANIES SUPPORT ISRAEL…LET’S (NOT) SUPPORT THEM…. Israel, Starbucks decided to help Israel ‘s floundering economy and invest in Israel . It has been revealed that Starbucks still continues to support Israel by sponsoring fund raisers for Israel . 2. THE LIMITED STORES, Express, Lerner New York , VICTORIAS SECRET and BATH & BODY WORKS: The Limited, Inc. was founded by Leslie H. Wexner in 1963 in Columbus , Ohio . Includes: THE LIMITED STORES, Express, Lerner New York , VICTORIAS SECRET and BATH & BODY WORKS, and employs over 115,000 people. Its founder, president and CEO Les Wexner is a Zionist. He is on the board of directors of Emet, the Pro-Israel Media ‘War Room’ whose function is to ensure that all media in the US stays biased in favor of Israel . In 1984, Les Wexner who is one of the world’s 200 wealthiest people created the Wexner Foundation. Its mission statement is ‘strengthening Jewish Leadership in North America and Israel .’ One of the programs the Foundation runs is the Wexner Israel Fellowship Program which annually brings up to ten Israeli have participated thus far. The Wexner Foundation sponsors ‘Birthright Israel ‘ – a program that pays for young American Jews to take free indoctrination trips to Israel . It is also a long-standing supporter of Hillel – the bastion of Zionism on campus. 3. THE HOME DEPOT: Its founder and co-chairman of the Board is an active Zionist. He created the board of directors of Emet, the Pro-Israel Media ‘War Room’ whose function is to ensure that all media in the US stays biased in favor of Israel . 4. DISNEY: Walt Disneys Millennium exhibition at the Epcot Centre in Florida depicts Jerusalem as the capital of Israel . Of the 8 million dollars it cost to set up the exhibition, Israel contributed 1.8 million and worked with Disney to develop its content. The buy up of Israeli company Mirabilis, creators of ICQ (internet chat program), for $287m in 1998 forms part of AOLs investment in Israel . In 1998, Mr. Ted Leonsis, CEO of AOL studios (a business unit of AOL) received the Jubilee Award by the Israeli Prime Minister Netanyahu. This is the highest tribute ever awarded by the ‘State of Israel in recognition of those individuals and organizations that through their investments and trade relationships have done the most to strengthen the Israeli economy. 6. COCA COLA: From 1966 onward Coca-Cola has been a staunch supporter of Israel . In 1997 the Government of Israel Economic Mission honored Coca-Cola at the Israel Trade Award Dinner for its continued support of Israel for the last 30 years and for refusing to abide by the Arab League boycott of Israel . In contrast Pepsi abided by the Arab League boycott of Israel which ended in May 1991, after 1992 Pepsi is also trading in Israel . In 2001 the Coca-Cola World Headquarters hosted and was the main sponsor of the American-Israel Chamber of Commerce Awards Gala. It has been revealed that Coca-Cola Israel sponsors training programs for its workers on subjects including the Israeli-Arab conflict. The course content is created by a company funded by the Jewish Agency and the Israeli government. In July 2002, it has been announced that Coca-Cola is to build a new plant at Kiryat Gat. 7. ESTEE LAUDER: Estee Lauder’s chairman, Ronald Lauder, also one time chairman of the Conference of Presidents of Major American Jewish Organizations, is the current president of the Jewish National Fund (JNF) – Ronald Lauder is an ardent Zionist. 8. SARAH LEE. (Includes Hanes, Playtex, Leggs, Champion). This is also not to be confused with the frozen snacks company. This is in regard to the clothing giant. Sara Lee owns 30% of Israel ‘s leading textile company Delta Galil. Sara Lee is the world’s largest clothing manufacturer, this opens the worlds markets to Israel , with cloths originating in Israel and being sold around the world under one of the many famous Sara Lee brands. In 1998, Mr. Lucien Nessim of Sara Lee Personal Products received the Jubilee Award by the Israeli Prime Minister Netanyahu. This is the highest tribute ever awarded by the ‘State of Israel ‘ in recognition of those individuals and organizations, that through their investments and trade relationships, have done the most to strengthen the Israeli economy. 9. FOX TELEVISION, FOX ENTERTAINMENT: The News Corporation Limite is one of the world’s largest media companies with total assets as of September 30, 2005 of approximately; US $58 billion and total annual revenues of approximately US $18 billion. News Corporation’s diversified global operations include the production and distribution of motion pictures and television programming; television, satellite and cable broadcasting; the publication of newspapers, magazines and books; the production and distribution of promotional and advertising products and services; the development of digital broadcasting. News Corporation is the world’s leading publisher of English-language newspapers with operations worldwide. The Company publishes more than 175 different newspapers, printing more than 40 million papers a week. called NDS, has grown from 20 to 600 employees in the past decade. 10. NESTLE: The Swiss company owns 50.1% of Israeli food maker Osem Investments. In Dec. 2000, it announced it will invest millions of dollars to operate the new R&D centre in Israel . In 1998, Mr. Peter Brabeck-Letmathe on behalf of Nestle, received the Jubilee Award by the Israeli Prime Minister Netanyahu. This is the highest tribute ever awarded by the ‘State of Israel ‘ in recognition of those individuals and organizations, that through their investments and trade relationships, have done the most to strengthen the Israeli economy. 11. OVERSEAS ADVENTURE TRAVEL: Company is based in Massachusetts , is known for their many world tours and relatively cheap group travel. The company donates money to over 50 countries in which it operates in to help fund schools, food aid, etc. and averages between $5,000 and $25,000 per country. However, Israel received a flat $1,000,000 from Overseas Adventure Travel, as it’s president is a Zionist. 12. IBM: IBM invests heavily in Israel . IBM senior vice-president and general counsel, Lawrence Ricciardi, who noted that his company employs 1,700 people in Israel, said in an interview with the Jerusalem Post, ‘This wedge of land and the huge ideals it represents are very important to IBM.’ IBM was one of three US companies that was lauded at the America-Israel Friendship League Partners for Democracy Awards dinner ( 25th June 2001 ) hosted by Sharon. In May 2002 the Israel-America Chamber of Commerce awarded IBM the Ambassador’s Award’ in recognition of its outstanding contribution to the development of the Israeli high-tech industry and to advancing trade between the U.S.and Israel. IBM established operations in 1949 and was the first large American company with a wholly owned subsidiary in Israel , introducing computers to the country. 13. KIMBERLY-CLARK: (Huggies, Kotex, Kleenex) In 1998, Mr. Robert P. Van der Merwe, chairman of Kimberly-Clark Europe received the Jubilee Award by the Israeli Prime Minister Netanyahu. This is the highest tribute ever awarded by the ‘State of Israel ‘ in recognition of those individuals and organizations, that through their investments and trade relationships, have done the most to strengthen the Israeli economy. Kimberly Clark Corp owns 49.9% interest in Israeli company Hogla (6/96) through America-Israel PaperMills $49.9m. 14. RIVER ISLAND clothing chain, ISROTEL and IBROTEL HOTELS in Spain and Portugal , BRITANNIA PACIFIC PROPERTIES. (This one probably relates least to any of us) – a diversified international investment company, with headquarters in London , England . They said to be one of the largest real estate owners in the Sacramento Metropolitan area. It appears that the British based Lewis Trust Group is one of the companies developing hotels in the Aqaba Region. David Lewis, the Chairman of the company, is a prominent supporter of Israel . Mr Lewis’s activities have included the raising of money for the Jewish National Fund. He is also a member of the Israel-Britain Business Council. This organization is dedicated to the development of the Zionist State , by channelling British capital to the occupied territories for the benefit of the Zionists and the exploitation of the Palestinians. 15. NOKIA: Nokia have started to invest heavily in Israel . Nokia general manager Lars Wolf said in an interview with The Jerusalem Post (4 March 2001): ‘We are really focusing on Israel from all perspectives, because we have an internal project called ‘Project Israel ‘ which means we a re looking at Israel from a networks perspective, from the perspective of Nokia Ventures Organization, and also from the perspective of Nokia Research Center.’ Nokia Venture Partners, a branch of Nokia Ventures Organization, launched a new $500 million fund in December 2000 and allowed that a ‘disproportionate’ amount of it would go into Israeli companies. Nokia Research Center is on the lookout for Israeli start-ups with which it can cooperate. 16. TIMBERLAND: (clothing, shoes, boots, jackets, etc.) Timberlands is a $1.1 billion footwear, apparel & accessories company. Its President and CEO Jeffrey Swartz is an active Zionist. In a recent ‘solidarity visit’ to Israel, where he made it clear he was speaking as the CEO of Timberland, he suggested sending 100 IDF soldiers to the US for a week as ambassadors for Israel. Although Timberland is a publicly traded company, his family holds approximately 47% of the stock and has approximately 81% of the voting power. 17. DESERT EAGLE: Desert Eagles are the only firearms that Israel does not buy from the US or other countries. However, many of the parts of these firearms are imported from other countries and they are merely assembled in Israel . Regardless, Israel prides them as their own and it is strictly an Israeli company. 18. CATERPILLAR: Caterpillar is a company based in Illinois that manufactures large construction equipment such as bulldozers, tractors, various demolition equipment and has a line of ‘tough guy’ clothing apparel. Caterpillar happily supplies Israel with all of its current fleet of D9 and D10 bulldozers, some of the largest armoured bulldozers in the world. Grandma in Georgia Schools Senator Chambliss on Guns and More! The founders were VERY clear about the purpose of the 2nd Amendment and it had nothing to do with hunting, sport or personal protection from street crime… it HAS everything to do with protection from treasonous leaders and out of control government. ANY usurpation of gun rights is in direct violation of the purpose of the 2nd Amendment and ANY representative who votes for or even abstains from voting on a single restriction of the rights of the people PROTECTED by the Constitution and Bill of Rights is guilty of a treasonous act. Continue Reading… Don’t miss out on the rest of this letter. Carole Jean (C.J.) 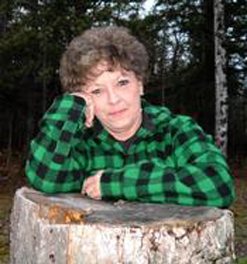 Williams will be laid to rest Tuesday, January 29, 2013 in her much beloved Upper Peninsula (UP) in Michigan. A good friend published one of C.J.’s articles – Old Dog – and I hope you enjoy it as much as I did. C.J. needs no one to write beautiful words about her in death because she wrote so many of them in life for all of us… those words tell us not only about her, but about the downward-spiraling society (plural for around the world) in which we live. Thanks to Jim/Old Dog (at A Nation Beguiled — http://anationbeguiled.wordpress.com/) and my dear friend, Bob Bidwell, for sending this reminder of how uplifting words of truth can be! Before sitting down to thump away on the old keyboard, I reflected on many facts learned that lend credence to the hornet’s nest I uncovered a few years ago. What I stumbled upon then was preposterous, too outrageous to be true, but the facts keep hitting me right between the eyes, and the sad truth is that there really is a United Nations’ Agenda 21, a nasty old plan for the 21st century that will remake us into cloned, mindless worker have-nots. There really is a Wildlands Project to turn our country into a nation of sniveling and beggarly, Mother Nature worshiping Sheeple, apathetically willing to bow to the dictates of elite Fascists running the New World Order. The Wanta Saga leads us into the uncharted territory of government corruption when this American hero was arrested and imprisoned for a non-existent unpaid, estimated civil tax scam in Wisconsin. Lee Wanta’s story involves other names with which we are familiar – like Vince Foster and Hillary Clinton and Marc Rich who was the last person former President Bill Clinton pardoned before leaving office. The thing for which Ambassador Lee Wanta is best known is that of being the richest man in the world. Many have called him the $27.5 trillion man. I hope we’ll have time to explain how this one American patriot earned all of that money and how he intended – and still intends – to use it to benefit the people of the nation he so loves.